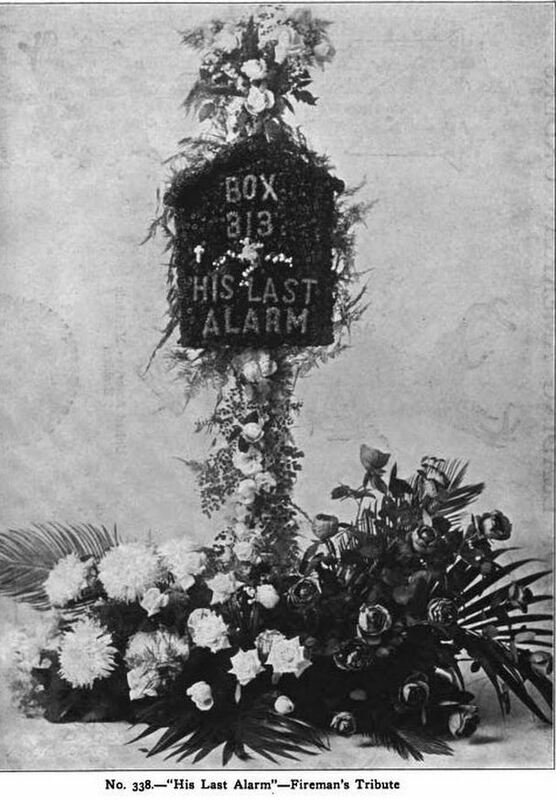 1908 Crown and shield funeral arrangement. A CROWN, AND WHAT CAME OF IT. It was a busy day with the florist. His counters were filled with bouquets, crosses, wreaths, and filling baskets. The florist, Karl Breitman, was at work himself superintending even his wife was pressed into service, and was making a bridal bouquet of fragrant orange blossoms. Presently a carriage stopped, and a tall, elegantly dressed young lady came into the shop. Karl stepped forward to take her order. “I wish to leave an order for a crown of white flowers for a funeral to-morrow morning,” she said. “I am so sorry, madam, but as madam sees, we are so busy. A wedding to-night, a funeral to-morrow, half a dozen parties, and so many baskets ordered—it is quite impossible,” answered the little German, politely. The young lady looked disappointed, but as she turned to go Mrs Breitman stopped her. “I will see to it, miss, that your order is filled. Only leave it with me. He’s so busy,” pointing at her husband. To speak truthfully, Mrs Breitman was a miserly soul, and could not bear the thought of losing the prospective money, for she saw by the carriage at the door and the young lady’s appearance that this was a wealthy customer. “Thank you,” said the lady. “It is kind of you. I want a crown of pure white flowers.” “That will come very expensive, miss,” observed the florist’s wife, anticipating the ready answer—”never mind expense. I want it just so, and as handsome as you can make it.” “Perhaps a little cross of violets on the top would suit you, we make so many;” suggested Mrs Breitman, her eyes sparkling as the lady assented, for violets were just coming into season and very expensive. “Good afternoon, miss. Shall I send you the bill?” inquired Mrs Breitman, following the young lady to the door. Then she fell to thinking of the lady, Mrs Willis, who was to be buried to-morrow. “Four crosses, six wreaths, a crown and loose flowers,” said she to herself. “He loved her well. It’s not two years since I made her bridal bouquet. Dear heart, I wish tonight’s bride a longer life.” When the cross of violets was made, surmounting the crown Mrs Breitman surveyed her handiwork with true artistic pleasure. It was beautiful indeed. The absence of the stiff japonicas and heavy tuberoses gave it less of a funeral look and more the semblance of a heavenly crown. After tying Miss Lester’s card on, her work was complete, and she had time to assist with the other crosses. “The world shall never lay down laws for me,” said Mary energetically. “I think for a friend to strew flowers on the person of a loved one who has gone is beautiful; but, oh, this reduction of poetical sentiment to fashion’s edicts,” and she smote her little palms together so violently as to make her mother start. “Yes, I remember,” answered Mary, thoughtfully. She spoke little on her way home, and was rallied by her mother for her absent air. “I am thinking,” said she briefly. She did not like to say that her thoughts were full of that tall handsome man, with his little blonde wife, who had sat just before them in church. Sunday after Sunday. Mary had seen them together, and she was wondering if he had loved her much; if he grieved sorely for the lost. How sorely Mary did not know. Williard Willis was bowed in grief for the loss of his wife, his little Clara. He felt deeply too, now that she was gone, that he had not valued her enough, had treated her too much like a child, had been often impatient with her waywardness. Now that Death has laid his cold seal upon her, all her faults were forgotten and only the winning, loving ways remembered which had won his heart before marriage. It was the morning of the funeral. The air was heavy with the scent of flowers. His sister, Mrs Carr, was arranging the floral devices about the fair marble figure in its last resting place. “I’ll ask Willard,” said Mrs Carr, starting forward with the crown in her hand. “Well, I’ll put it aside, and after the service I can ask him. Here comes the Bishop;” and up went Mrs Carr’s handkerchief to her eyes, as she sailed forward in her new mourning to meet the venerable prelate. When the last sad rites were over, Willard Willis returned mournfully alone. The first thing he saw was the crown standing upon the mantle, where his sister had placed it, All his loss rushed over him at the sight of it, and scalding tears filled his eyes. Who can despise his weakness? None that have known grief such as death brings. His reverie was interrupted by Mrs Carr. “Oh, Willard, I am glad you are at home. Now, do be a good brother, and take Helen to Mrs Hubbell’s party this evening, I cannot go, and she has set her heart on it, Don’t disappoint the child. Oh, I know you are in mourning,” seeing him glance at his dress, but Clara has been dead over a year now. Sarah Spencer is going, and she was Clara’s own sister. Don’t disappoint your little Helen.” Willard was just going to say “No”— the word was trembling on his lips, when Helen herself came running into the parlor, and looked up appealingly at her brother, with tears in her eyes. He could not refuse his favorite little sister, and promised he would go, although he feared he would be out of place in a gay assembly. But when, once more clad in evening dress, with his pretty sister on his arm, he entered Mr. Hubbell’s parlors, and met with gentle greetings on every side, he felt as if he were again in his element. After supper, as he was leaning against the parlor door, watching the waltzes of the German, his hostess captured him, saying, “Mr Willis, I am going to introduce you to a lovely young friend of mine who does not dance,” and leading him to a lady in pink she pronounced the cabalistic words, “Mr Willis allow me to present you Miss ___.” The name was lost in the crash of the band. Willard gave her his arm and led her to a little reception room on the other side of the hall. “Here at least we can talk without splitting our throats in trying to overtop the band,” said he, and talk they did, until Helen, a most exhaustless dancer, came for her brother to take her home. Willard found the young lady a most delightful conversationalist, witty, piquant, intellectual, and original, and could hardly believe they had been talking two hours until convinced by his own watch. The next Sunday Willard joined his new acquaintance coming out of church, and accompanying her home, received an invitation to call, which he availed himself of very soon. He discovered her name to be Miss Lester, and soon found himself identifying her with the lady who sent the crown. One evening bearing her mother call her Mary, these suspicions grew stronger, and they were confirmed when he compared the address on the card in his possession with her residence. He found Miss Lester occupying a large share of his thoughts. If he was pleased with a book, she must read it; no plan was undertaken without her approbation; and as Willard knew all the symptoms, he soon knew he was in love, deeply in love with Mary Lester. “It is all those flowers!” thought he, “If she had never sent them I would never have thought of her again after our casual meeting, but I wonder—-” Then he asked himself for the thousandth time. “Why did she send me this crown?” Finally he concluded to ask her, which was, after all the wisest plan. To his great disappointment, she denied all knowledge of it; but when convinced by her card, she recollected sending a crown to her cousin Marianne on her husband’s funeral. “It was some fearful mistake of the florist,” said she at length. “Oh, Mr. Willis, what must you have thought me capable of! Setting my cap at you the moment you were available!” and she buried her face, suffused with blushes, in her hands. “To speak truly, I did not put that construction on, but it does look like it. Oh, Mary, how could you do it! And I, a poor, helpless innocent man, have walked right into the snare, for you have caught me. Mary, my darling, I love you truly,” taking her hands down. “Don’t hide your pretty face, or, if you must, hide it here,“ drawing her head to his shoulder. Need the rest be told? Mrs. Willis, No. 2, thinks widowers very bold wooers, but her husband says she encouraged him at first before he ever dreamed of marrying again, and this is the only rock on which the happy couple split. And in their happiness the dead is not forgotten for a pretty rosy-cheeked little girl bears the name of Clara Spencer. Mrs Daffodil’s Aide-memoire: There was a delicate art to the etiquette of funeral flowers. In many communities the floral tributes were listed in the newspapers with the donor’s name so that everyone might see how generous they had been. 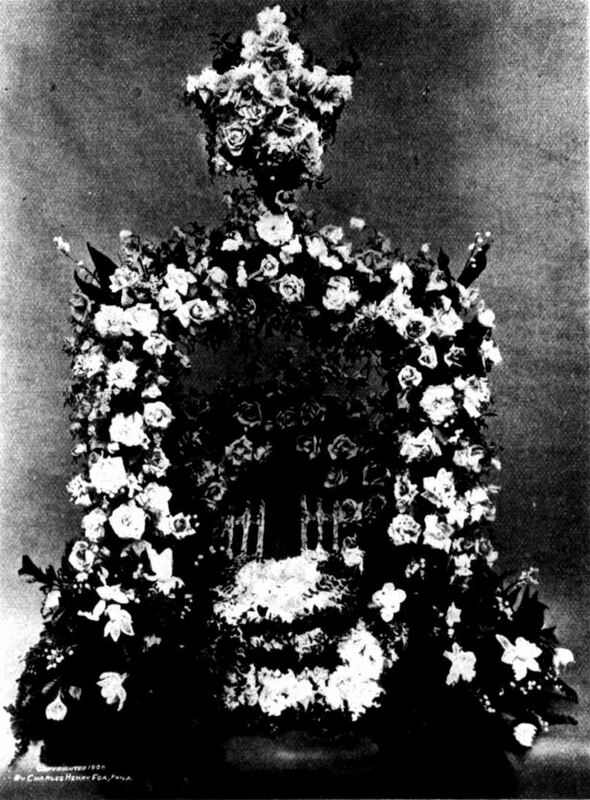 A crown–or wreath–was perhaps the most common floral tribute, although they came in all shapes and fancies: crosses, sheaves of wheat, urns, pillows, and shapes representing the deceased’s profession or fraternal affiliations, or perhaps a phrase from a hymn such as “the gates ajar.” These tributes became more and more elaborate until they were ridiculed as vulgar in the very press that had, shortly before, listed them reverentially. Miss Lester was quite right to be mortified; if she as a single woman had sent a floral crown to a widower, it would have been unspeakably forward, as she rightly observed. But a happy ending, we hope, all round. Mrs Daffodil was struck by the delicate insinuation that Mr Willis was not so much mourning his childish, foolish, and frivolous wife as his own foolishness in his “greater intellect” being “caught” by her beauty and “winning ways.” One hopes that he did not regret being “caught” a second time by a woman to whom, he admits, he would not have given a thought except for that crown of flowers…. This entry was posted in Courtship, Death, etiquette, Gardening and flowers, Gentlemen, Husbands and Wives, Mourning, News and Announcements, Victorian, Weddings and tagged funeral etiquette, funeral flowers, sending flowers to a funeral, Victorian mourning, Victorian widower, Victorian widower remarries on June 11, 2017 by chriswoodyard. Since the Family is away on holiday over the week-end, Mrs Daffodil is taking this opportunity to take a brief holiday of her own, possibly paying a visit to the Chelsea Flower Show and returning, refreshed, Wednesday next. She has posted on floral themes many times, so, to while away the hours for those of Mrs Daffodil’s readers who will be counting the moments until a new post appears, here are some posts pertinent to the topic of flowers. Mrs Daffodil wishes all of her readers a delightful and restful week-end with well-filled picnic hampers and unclouded blue skies. This entry was posted in Edwardian, Fads, Frolics, Gardening and flowers, Gentlemen, History 1800-1837, Holidays, Lace, Mourning, News and Announcements, Professions, Royalty, Short Stories, Victorian, Weddings and tagged black rose, Chelsea Flower Show, flower superstitions, flowers, funeral flowers, garden gnomes, gardening, Josephine, mourning flowers, Napoleon, Queen Adelaide, Saki, Victorian mourning, wedding flowers on May 26, 2017 by chriswoodyard. 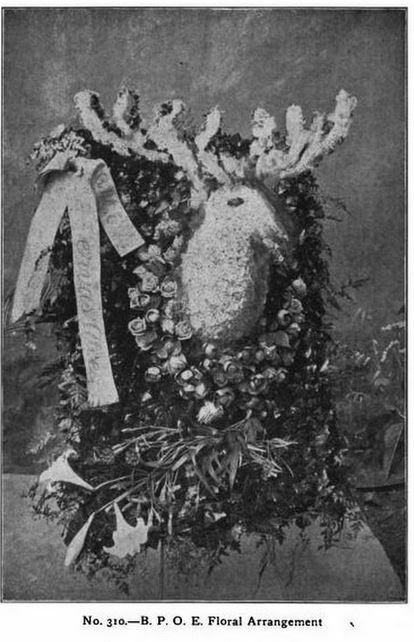 1906 Floral Tribute for a member of the Elks. To-day, Mrs Daffodil (since she cannot exactly say that she is “pleased to welcome”) once again yields the floor to that funereal person over at Haunted Ohio, Chris Woodyard. One supposes it is useless to suggest a change of climate, subject, or temperament to a writer so entrenched in the subfusc world of Victorian mourning, but Mrs Daffodil will gently note that a holiday in some sunny Mediterranean country might be cheering. Mrs Woodyard will address the history of grave concerns over grotesqueries in funeral flowers. 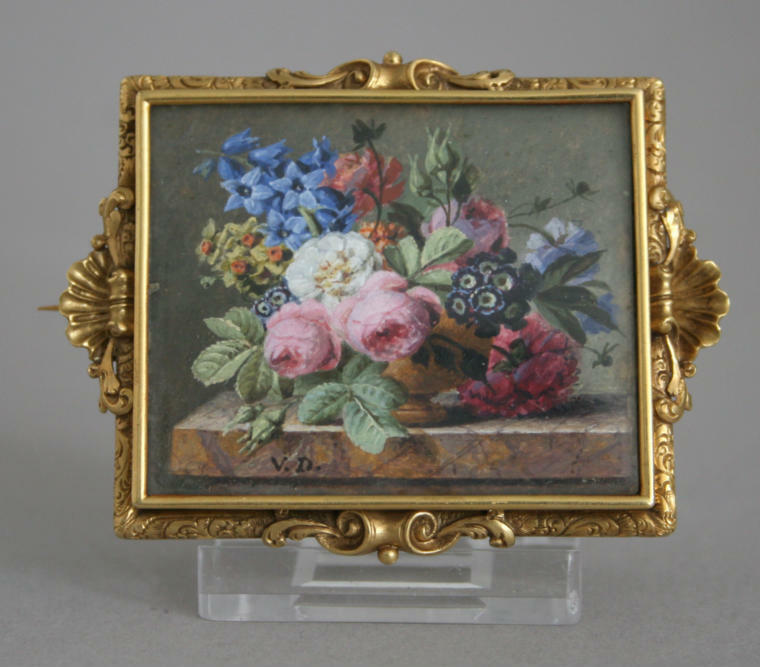 Flowers are an appropriate symbol for the excesses of the Victorian funeral. Newspapers documenting large funerals would note the details of these sometimes bizarre floral arrangements and their donors as if keeping score and setting a societal standard for the next bereaved family. The florists claimed that floral excess was a result of customer demand; the public, in turn, said that the pressure arose from over-zealous florists. There were also dark whispers about innocent flowers being tortured into strange and unnatural shapes. Funeral “set pieces” generally fell into several categories: wreaths, pillows, and sprays—and, said the critics, monstrosities. 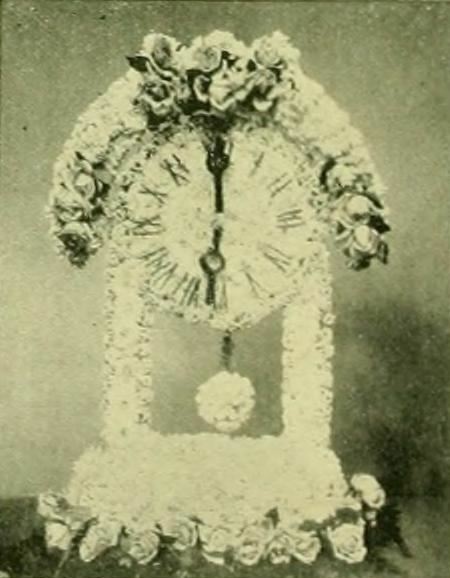 Some of the latter had evocative titles and florist supply catalogues carried wire frames to create the more elaborate arrangements such as “Faith, Hope, and Charity,” (an anchor, cross, and heart) “The Sad Hour” (a floral clock); “The Broken Wheel,” “The Harp,” (or lyre) and “Gates Ajar,” an exceptionally popular design. Stuffed doves, often used to accessorize the “Gates Ajar” arrangements, could be purchased or leased. “Gates Ajar” arrangement topped with a star. For this next story of a client who desired a floral horse’s head with real glass eyes, I’m afraid I do not have an illustration. Perhaps these rather ghastly arrangements for deceased members of the Benevolent and Protective Order of Elks will give an idea of what the ultimate effect might have been. 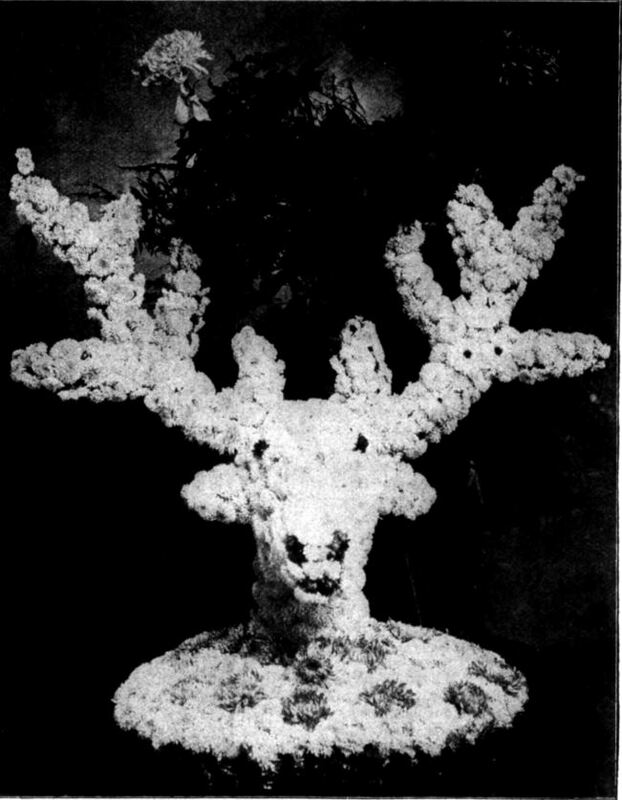 1906 Benevolent and Protective Order of Elks floral tribute. Floral tribute for Charles W. Post, founder of the Postum Cereal Company. This “bag-man’s” traveling valise was railed against in 1903, yet was still being included in the pages of funeral flower albums in 1914. As an example of how not to do it, the accompanying illustration of a floral traveling bag may be worth a place. 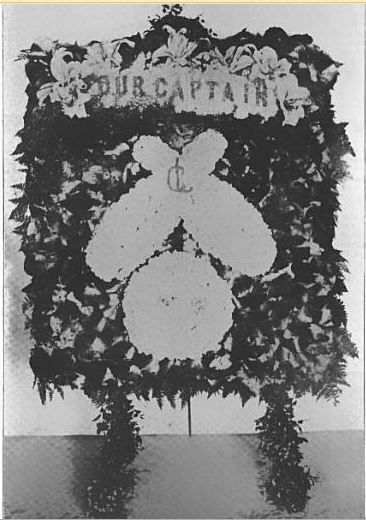 The design from which the photograph was taken was made by the Iowa Floral Co., Des Moines, for some local traveling men and gave great satisfaction. The body was of Enchantress carnations, the ribs on top and ends of Lawson, while the handle was of violets. When an order of this kind comes along it has to be filled, but such freak things are in every way to be deprecated. They are a good deal of trouble to make and use a lot of stock lessening the retailers’ profit unless a very big price is paid. But as to anything pretty or artistic there is absolutely nothing in them. It is not even possible to see a good flower in the whole thing for the carnations are cut short and stemmed and packed just as thickly as possible together. It is devoid of all beauty and no retailers with a sense of the artistic or the uplifting of the trade at heart will encourage the making of such flat, ugly and unprofitable things. As hinted above retailers have not always the last word on such points but the making of this class of goods should be discouraged as far as possible. How much more satisfactory in every way would a pretty wreath or other design be than this, supposing the same amount of money was spent. This kind of “art” is best left to the candy makers and confectioners. It is unworthy the attention of florists. 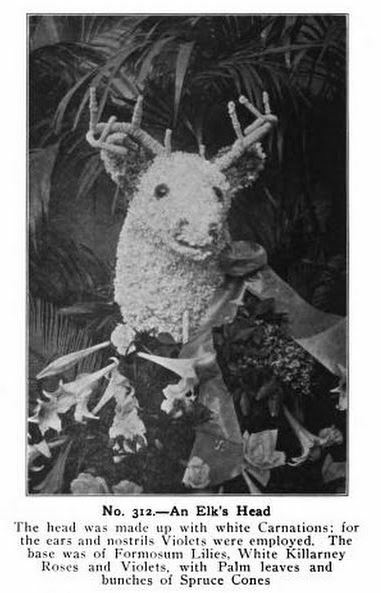 The demand for special funeral emblems applicable to the vocation of the deceased oftimes taxes the inventive genius of the florist, and some of the pieces suggested by the surviving friends frequently seem very ridiculous. A butcher in our vicinity, being in condition for a funeral, one of his intimate friends came to order a floral offering and insisted on its being in the form of a cleaver. It occurred to me that such an implement was hardly the proper thing. But no one could tell the road he went or the conditions he would encounter at the end of his route. Perhaps it was the very thing he would need. A commercial traveler having been assigned a new territory, in the unknown world, I was asked to make a floral grip for his funeral ornamentation, by some of his friends. Did he die of the grip, I asked. Oh, no! but as his satchel was his constant companion, one said, we thought it would be a very appropriate emblem for this sad occasion. Alright, I replied, it shall be made, but will I fill it with light underwear, or do you think something heavier would be needed? Not knowing his destination, they failed to advise, so as a precaution, the man being an acquaintance of mine, I filled the grip with wet moss, which you know has a very cooling effect. And how I wish I had a photograph of this postmaster’s novel floral tribute. Truly something for the dead-letter office! P.R. 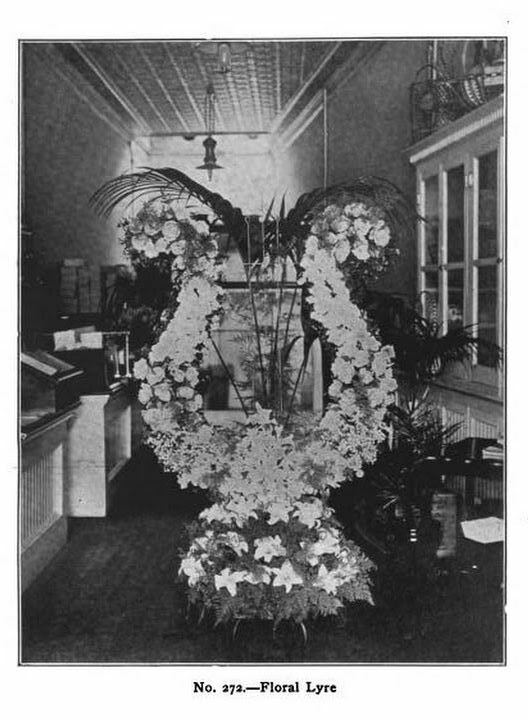 Quinlan & Co., Syracuse, N.Y., made a novel floral piece, the gift of the employes of the Syracuse post office in memory of Edwin H. Maynard, assistant postmaster. It was a 4-foot panel 24×42 inches containing a canceled envelope. The stamp was in pale colored Lawsons and the cancellation which bore the date of his death was in small blue chenille lettering. 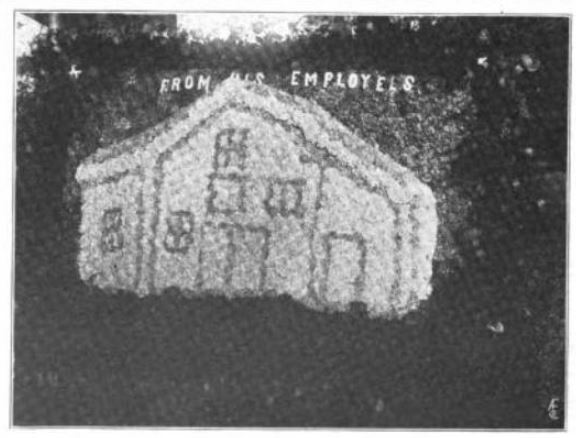 Upon the floral letter where the address is usually placed was the inscription, “To our beloved assistant postmaster.” The outline of the envelope was maroon carnations representing the envelope in mourning. The groundwork of the panel was Enchantress carnations trimmed with roses, lilies and swainsona. A.J.B. This “Sad Hours” arrangement is fully seven feet high. To judge by the cupboards on the right, this lyre arrangement is at least five feet high. Fraternal orders, trade unions, and vocational groups often clubbed together to provide floral tributes with the appropriate theme. Garish as these arrangements are, they pale by comparison with this last example, a floral tribute to a man whose life was cut short in a terrible accident. In the collection of unique designs, the one shown in the illustration on page 11 is entitled to a place at the front. It represents a derrick in flowers made by Lester F. Benson, an Indianapolis florist, on the order of a committee representing the Structural Iron Workers of America, for one of their members who was killed as a result of his gauntlet catching on the hook as the engine started. The man was lifted thirty feet from the ground before his cry, “Slack down,” was heard, and before the order could be obeyed the glove slipped from his hand, resulting in a fall which broke his neck. 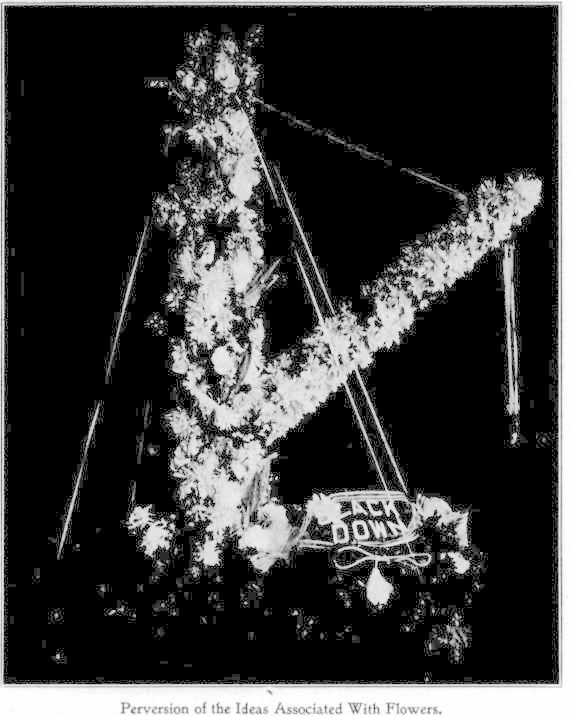 The design was made sectionally, to work the same as a real derrick, and the committee insisted on the florist placing a glove on the hook! Of course no florist maintains that such a design is in anything but the most execrable taste; such gruesomeness is an utter perversion of the idea which prompts the sending of flowers to a funeral. 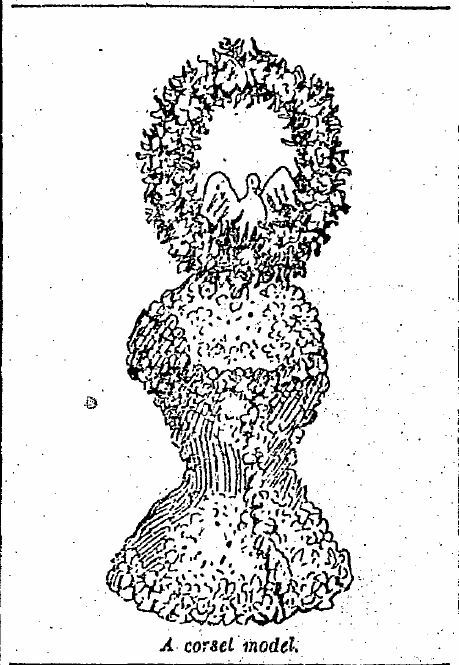 The flowers should carry a message of sympathy, and by their purity and beauty should speak of the life beyond, should contain no suggestion of mundane things, least of all a reference to the route of departure of “the late lamented.” The derrick design appears to be just one step removed from the limit. The man who wishes to accomplish the ultimate no doubt will make for a murder victim some such design as the following: Take two clothing-store wire dummies; fit them out with suits of flowers, instead of cloth; raise the arms of each, one figure leaning forward in the act of firing a flower pistol; bring the left hand of the other toward where a man’s heart is supposed to be, and the right hand to his uplifted head; lean this figure backward. Mount the two figures, in the relationship that will suggest itself, on a base of boxwood or galax and there will be nothing further that can be demanded of the florist, unless with such a design the widow fails to survive the shock. For the florist who makes monstrosities in flowers it is to be said: Hardly any florist has so poor a conception of the uses of flowers that he suggests any such designs; the florist nearly always simply is carrying out the instructions he receives from his customers, and must either do this or see an order involving a goodly sum go to a competitor. Florists are like others—they are likely to do that which they are best paid for doing, but it is in line for every florist to do something toward turning customers to better things in flowers. Still, one suspects that, despite the florists’ repeated and bitter condemnation of bad taste, there was money to be made by catering to the vulgar whims of the customer. 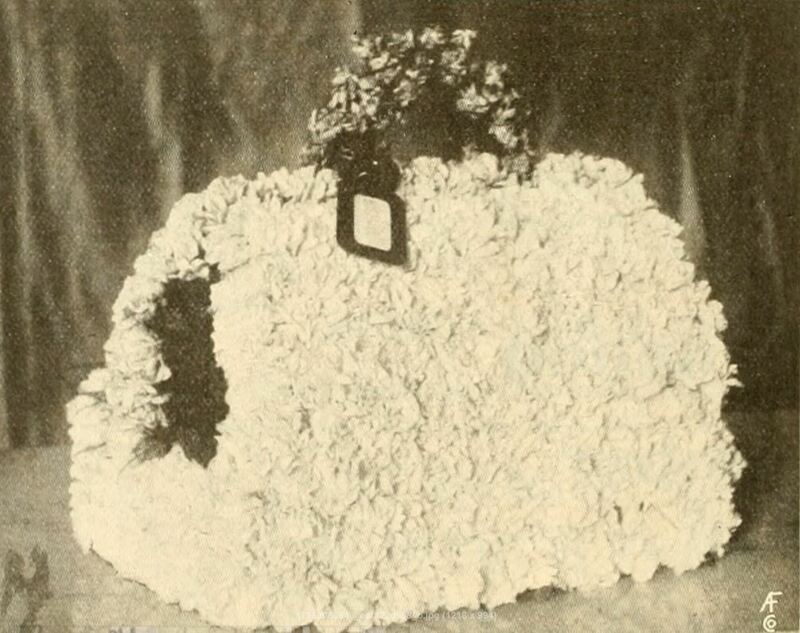 These set-piece shaped floral arrangements began falling out of favor around the time of the First World War when Victorian mourning conventions were thought to be less relevant in the face of so many deaths. Immense and garish floral tributes still had their place—at the funerals of gangsters and film stars, but by the mid-1920s they were considered thoroughly old-fashioned. The only pieces I’ve seen recently which seem to carry on the tradition of shaped floral tributes are U.S. flag panels and floral rosaries designed to hang inside the casket lid. 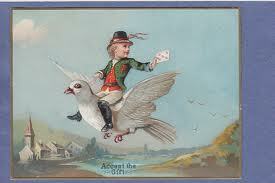 I have not had the opportunity to ask any modern florists if they ever get requests for flower lyres or for “Gates Ajar,” but in this Age of Individualism, I suspect that there are still orders for the unorthodox and highly personalized funeral arrangement, sans the stuffed doves. Mrs Daffodil’s Aide-memoire: Mrs Daffodil is sure that we are all very grateful to Mrs Woodyard for revealing these examples of vulgarity in funeral flowers, thus enabling us to avoid embarrassing faux pas at our own obsequies. 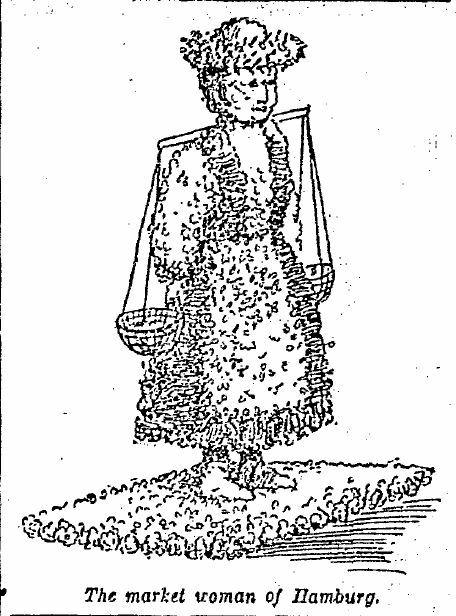 For more on funeral flowers, see these posts: “No Flowers” and Corsets and Beer Wagons: Floral Vulgarities, which also appear in The Victorian Book of the Dead. 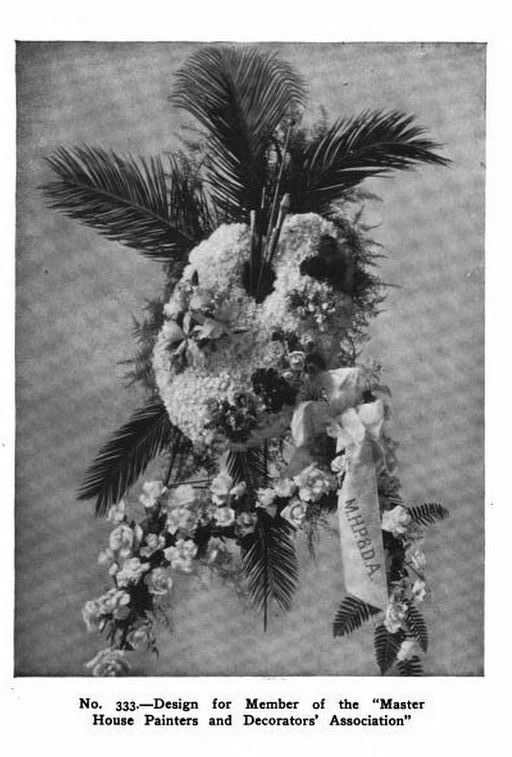 This entry was posted in Death, Edwardian, etiquette, Fads, Gardening and flowers, History 1910-1930, Mourning, News and Announcements, Professions, Victorian and tagged bad taste, bereavement, fads in flowers, florists, flowers, funeral fads, funeral flowers, gates ajar, mourning conventions, the sad hour, the vacant chair on February 24, 2017 by chriswoodyard. “What is an n.f. funeral?” I ventured to ask, after the young man addressed had left us. “No flowers,” sententiously answered the proprietor. “It doesn’t if we can help it—rest assured of that. We are here to sell flowers. The funeral trade forms an important part of our business, and we have to protect ourselves against the anti-floral cranks as best we can. The ‘no flowers’ order is a fashionable fad and nothing else. It originated in New York years ago at a funeral of one of the Vanderbilts, who requested that no flowers should be displayed during his obsequies. I was working for a new York florist at that time, and I well remember what a flutter this innovation caused among the tradesmen in our line of business. They did not care about losing the single Vanderbilt job, but they feared that such an example in the ultra-fashionable world would be followed by its general adoption. Thus a whim of fashion might deal a severe blow to the floral trade. The leading florists immediately held a conference and it was unanimously decided that the great funeral must not be permitted to set the fashion and inaugurate an anti-flowers era. 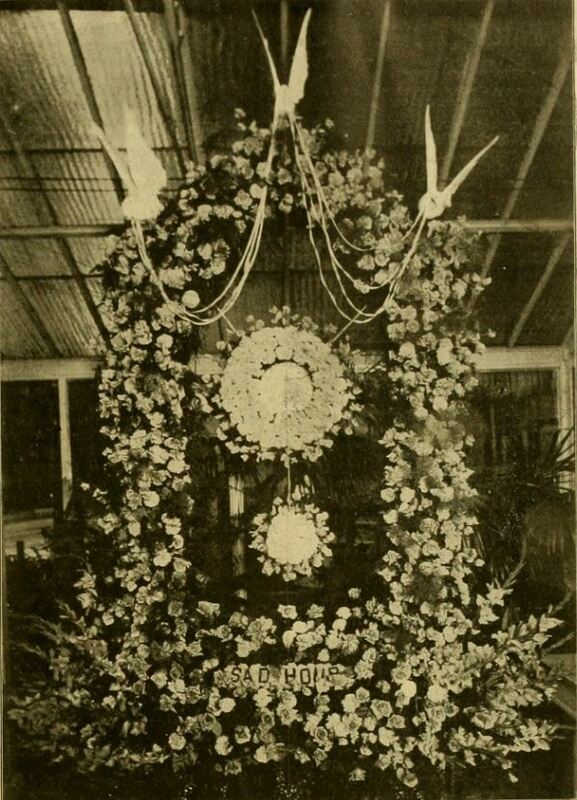 Several very costly and elaborate floral pieces were prepared, but I spite of all we could do the orders of the deceased were obeyed to the letter and we were unable to get a solitary flower inside the Vanderbilt residence. An attempt to bribe the servants failed, as they had received ironclad instructions not to permit a floral offering of any kind whatsoever to be taken inside the house. This ultimatum fell like a wet blanket upon our hopes, but still we determined not to quit the field without making one last bold ‘bluff.’ A magnificent ivy cross was made—one of the finest that ever was seen in this country. I was about six feet high and was composed of a mass of English ivy leaves and tendrils. It represented a good round sum, let me tell you, and a good deal of work. But there was not a bud or a flower in it anywhere. Just before the time appointed for the exercises to begin we took the cross to the Vanderbilt residence, and, as we expected, were stopped at the door by a liveried lackey, who denied us admission. Talk about push and business enterprise! Are there any limits beyond which they can not go? “No Flowers at Funeral” is an excerpt from The Victorian Book of the Dead, which contains other stories about floral tributes at funerals in its look at the popular culture of Victorian death and mourning. 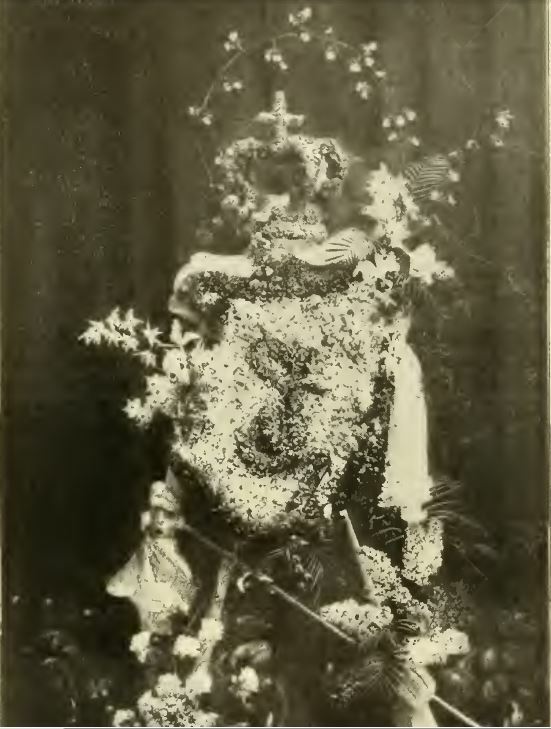 This entry was posted in Death, Fads, Gardening and flowers, Mourning, News and Announcements, Professions, Victorian and tagged anti-flower movement, floral tributes, funeral flowers, gates ajar, ivy cross, Vanderbilt funeral, Victorian funeral flowers, Victorian mourning on August 26, 2016 by chriswoodyard. Mrs Daffodil wishes all of her readers a delightful and restful week-end with opulent picnic hampers and minimal insect accompaniment. 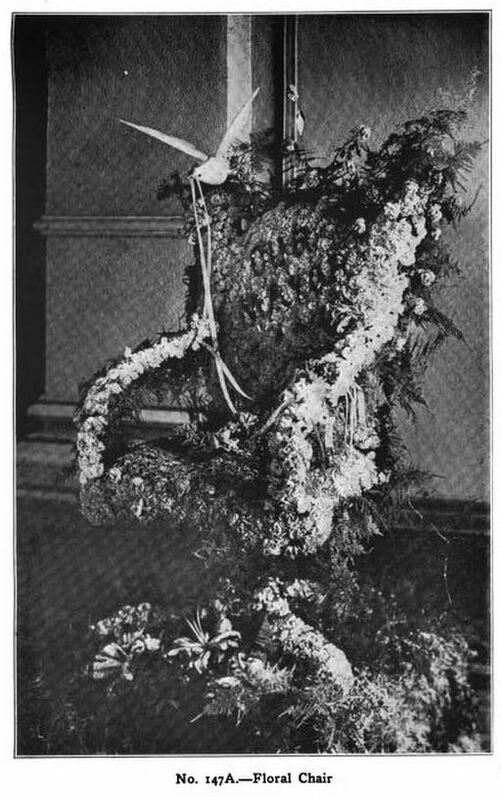 This entry was posted in Fads, Fashion, Frolics, Gardening and flowers, Holidays, Mourning, News and Announcements, Victorian and tagged Chelsea Flower Show, flower superstitions, flowers, funeral flowers, gardening, Mrs Daffodil Takes a Holiday, Victorian flowers on May 27, 2016 by chriswoodyard. 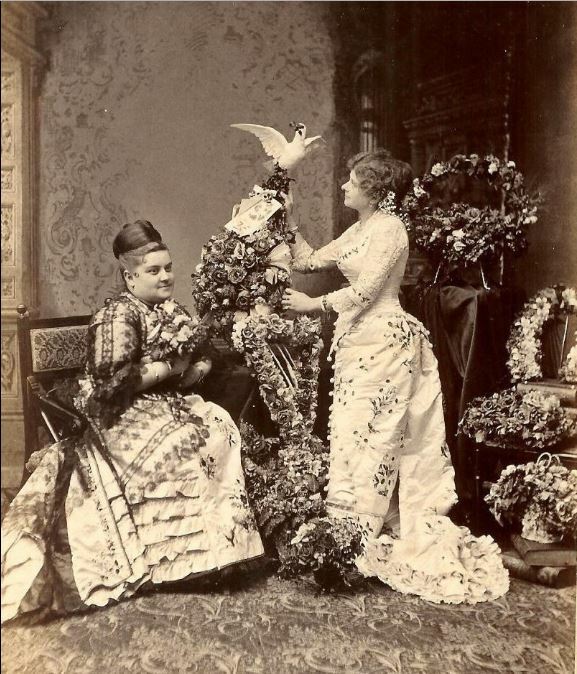 Two ladies and funeral flower arrangements including a harp, a horseshoe and a stuffed dove. Is It Not High Time to Call a Halt? Is it not time to cry a halt? Has not the attempted gilding of fine gold and painting the lily been carried far beyond the point of wasteful and ridiculous excess? These questions, surely, must strike any unprejudiced mind, any simple, natural, healthy, unperverted taste, in contemplation of the extreme lengths to which floral vulgarity and shoddyism have run. 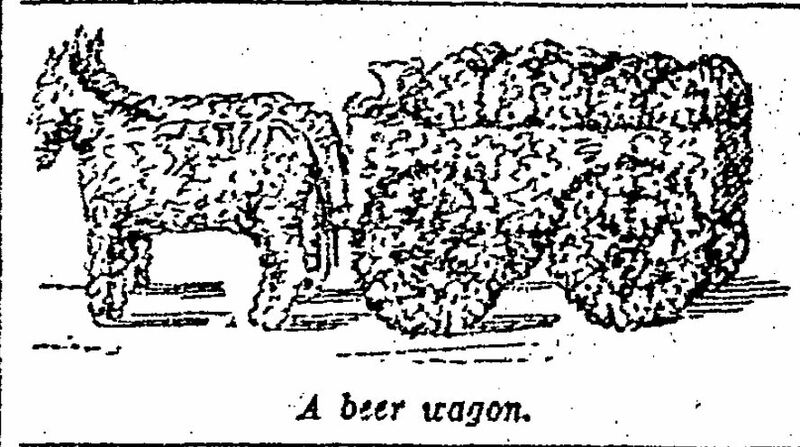 The writer verily believed that the end of the scale had been reached with such sacrilegious crudities as the “Gates Ajar,” but what can be thought of a “funeral piece” consisting of a beer wagon, laden with barrels and drawn by horses, all made of roses and smilax, with straw for the horses’ tails? Going back a little, is not a flower a flower? What more can be made of it? In poetry and in popular language alike the idea of a flower implies the thought of the crown of perfection. Why, the very name, “corolla,” the botanical term for blossom, means a crown. Is it artistic, to say the least, to torture what is already perfect of its kind into a shape altogether foreign to its character and which it was never intended to take? There are still in our midst innumerable sweet, old-fashioned, childlike souls, who fondly believe that the Lord made flowers just the way he wanted them. These do not hesitate to say that his works ought to be handled with something akin to reverence. It is a beautiful custom—one most certainly founded upon the purest and holiest instincts of human nature, one to which even the most degraded of our species must surely respond—to deck our dead and adorn their last resting-place with flowers. But why seek to do what the old rhetoricians called “improving the sublime?” The result is caricature, if nothing worse. 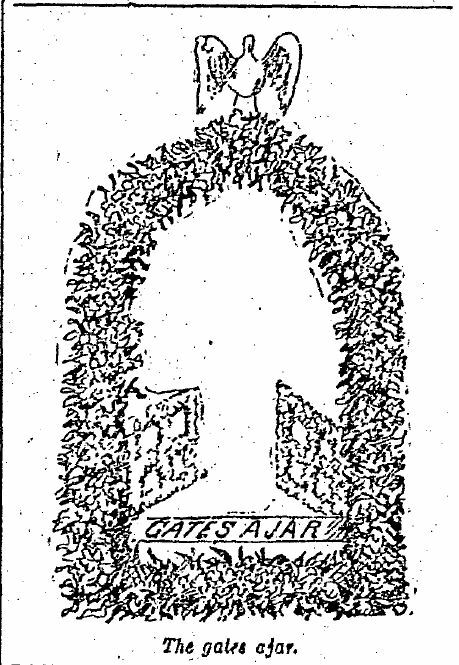 Imagine the steps leading to the “Gates Ajar” (what mortal has any adequate conception of the gates of Paradise?) lettered in purple chenille! Think of a silent harp with the back made of tin-foil, or a sickle whose edge will not cut, or a pillow upon which no tired head could rest, or a broken column with the break smoothly “plastered”! Still worse are funeral wreaths made of dyed immortelles and aniline-colored grasses, or of stiff, monstrous china roses, or death-lie waxen ones mingled with tawdry, tinseled leaves. If slaughtering birds for millinery purposes is sufficiently reprehensible to attract the notice of “Audubon Societies” and “Bird Defenders,” what must be thought of our present custom of mixing the bodies of white doves among our floral atrocities? Are we much better than the old barbarians who sacrificed animals at the death of their relatives or of persons of distinction? What has become of the beautiful, heart-cherished superstition, if you choose to call it so, that it is a sin to hurt a dove because it is an emblem of the Holy Ghost? Even if the sense of the fitness of things in many minds were not outraged by such use of a lovely bird, common sense should teach any one that killing an inoffensive creature will not make the departed dear one any happier in the other world. Talk to an intelligent florist and you will find that he agrees with you. “Floral emblems are in bad taste, I know,” he admits. “Flowers cannot be made to look well in anything but the simplest designs, like a cross, a wreath or a basket. But what can we do? People want broken wheels and things like that; we must supply the demand for them or we’d starve. The worst of it is some people know that floral designs are generally signs of vulgar ostentation, but they feel that they cannot help themselves. They send a floral piece to a friend’s funeral because they’re afraid they’ll be thought mean if they don’t. Their hearts would prompt them to send simple clusters of cut flowers, but they fear that they’ll be misunderstood. To my mind the floral pieces are more funereal, more suggestive of death than death itself. “Some people order floral pieces because they feel that they are getting a bigger show for their money. In a piece, poor flowers can be worked up to look better than they are. Cut flowers must be good specimens or their case is hopeless. There is no way of disguising their imperfections. But the climax was certainly reached at the last floral exhibit held in this city. The “Market Woman of Hamburg” was a conflagration, a nightmare of flaming horror. The outrageous caricature of the human form was sufficiently terrible—but the colors were simply indescribable. The hat was wreathed with gaudy yellows in either coreopsis or marigold, perhaps both. The skirt was one glare of scarlet geranium and pink bougainvillea. The face, arms and hands were in pink and white tinted hydrangeas. Horror of horrors, the eyes were black shoe buttons. The monster carried real baskets filled with cucumbers and parsley, suspended form a stick yoke and it stood upon a square yard of red and yellow corollas, which told nothing but a pitiful story of how many poor plants had been ruthlessly robbed. We are not popularly supposed to be a nation of idolaters, but it is very certain that no heathen ever permitted a more abominable image to stand a day. Although the florist quoted in the foregoing threw the blame of the perpetration of floral funeral monstrosities upon the people who ordered them to be made, it is not just possible that the florists themselves are more largely to blame in this matter than they would have it appear? But a judicious admixture of advice with their queries for instructions they might, did they choose, bring about a change that would be most wholesome. Of course they get much better prices for such horrors as have been referred to than they would for simple clusters of cut flowers, and they also have their hands filled with flowers that must be worked off somehow, and which are not salable, except when “made up” in set pieces. They might not be able at all times to control the demand for monstrosities, but they could discourage their perpetration, instead of aiding and abetting them as at present. At all events, it is certainly tie to cry a half, and no one can so well or so powerfully take the first step as the florists themselves. The following designs show two early-20th century funeral designs. The first was a tribute from a bowling team and comes from The American Florist 8 August 1903. The second was a reminder: never send to know for whom the clock ticks; it ticks for thee. It is from Floral Designs: A guide in choosing and ordering flowers, 1902. Mrs Daffodil has previously written on funeral flowers here and there is a section on the subject in The Victorian Book of the Dead, available at various online book-shops. 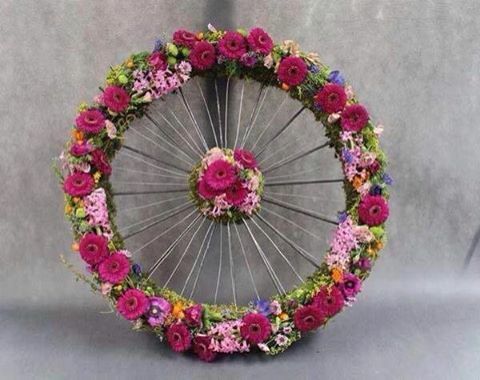 In a similar, personalised vein–Mrs Daffodil is uncertain as to whether her readers will find it vulgar, the colours are certainly quite lovely–a memorial wreath for a wheelman. From Elemental Cremation and Burial. 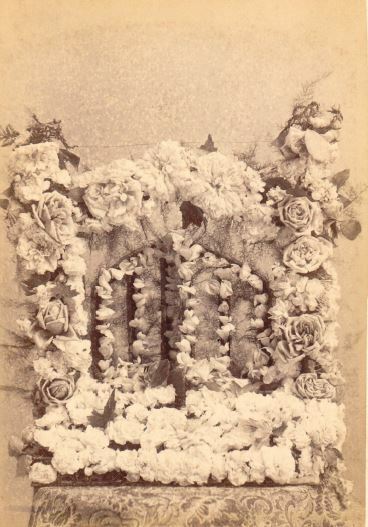 This entry was posted in Death, Edwardian, Fads, Gardening and flowers, Mourning, News and Announcements, Victorian and tagged Edwardian flowers, Edwardian funerals, floral arrangements, funeral flowers, Victorian flowers, Victorian funerals on October 3, 2014 by chriswoodyard.